So Wildstar has a day-night cycle as was inquired about by John in yesterday’s topic here. I’m not sure that there’s one for all the zones of the Nexus but given that I’ve experienced it several times over this past beta weekend in Celestion, Whitevale and Thayd even, I don’t see why the mechanic wouldn’t be applied across the board unless we are looking at different planets and solar systems in the future. Or non-solar systems respectively. While elaborating on day and night cycles is hardly ever a priority on any devspeak’s list, players tend to care a lot about the question of changing light and different times of the day for new MMOs. How many phases are there and for how long? Is it a 24-hour cycle? How dark is the night? Where can I find the timer on my UI? I am a passionate supporter of this feature for “authenticity’s sake”, wherever there’s a fitting context to be found which is the case for most fantasy MMO settings. Whenever a day/night cycle is missing I am the sadder for it, yes even in open world RPGs that often tend to disregard them. Without changing light even a virtual life feels oddly stagnant. It feels like a missed opportunity too for developers and designers to install different events and time-relevant encounters in the game. There is an extraordinary creative power to light, no matter real light or fictional, that we can all recognize be we students of quantum physics or mere observers of all the indirect effects and cosmetic wonders that light bestows on our senses. There is such painterly glory in dynamic light changes to a point where even the more ordinary and literally lack-luster is elevated to a state of brilliance. The night becomes frightening and mysterious for darkness’ sake, that absence of light. A morning heralds a better day, a day of possibility and things to come. Light is the great revealer of our reality but it is also constant interpretation and therefore it is poetry. There may be nothing new under the sun but neither is there ever the same. 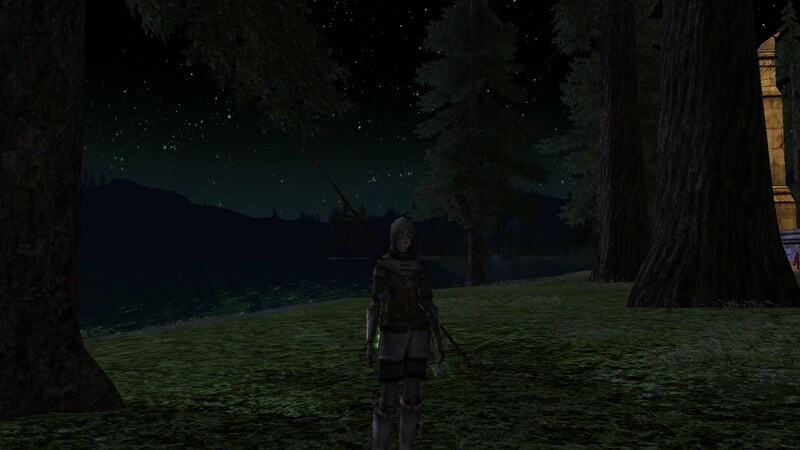 I played an MMO where it followed the 24 hour cycle and I was kinda bummed because I’d always play at the same time every day, and it was ALWAYS night time on the server. The world was always dark and I rarely got to ever see daylight. I remember the times in vanilla WoW when I was questing in Westfall and only ever experienced sunset, beautiful sunset, and then moonrise. While Westfall is a zone that has much to gain from the night’s black ink, I was taken aback when I visited during noon time for once several weeks later. So different was the atmosphere, so much more unnerving the shrill yellow all around. For other zones however, the night becomes an obstacle and players weary of hunting and questing for hidden objects that time of the day. They’ll take prolonged coffee breaks or re-schedule their ingame agenda entirely if they can. Light on a stick, I haz it. I’m not sure personally which cycle I prefer the most. There’s a good argument pro multiple mini-days, at the same time I dislike MMOs that rush their cycles and rush transition phases especially. I am fine with several hours of night if only I get a properly long and developed sunrise phase in return. I am weirded out when there’s a new nighttime every hour, a schedule that exhausted me quickly in Minecraft’s unmodded version. What day is too long and which night long enough? It’s a tricky balance and yet a discussion worth having. Light is ultimately a very important factor to our overall gametime and gameplay experience as well as greater immersion (for us explorers and suckers of the second home). I’ll happily take tricky, prolonged nights over none at all and bear a toxic afternoon sun for a chance of sunset. Thanks John for inspiring this post today. It was the waning light outside my window that told me it was time to publish and get on my way home. So far, my favorite is Firefall. Their darkness is pretty durned dark, and everyone is equipped with a flashlight. Considering this is a shooter, that’s pretty important because a lot of the environment is forest, and things can jump out of nowhere at any time. It’s made even more atmospheric thanks to the Melding walls which encircle the playable areas. These are giant blue-black barriers that give off a slight glow, and which are infused with occasional static bursts. Maybe if they made it more like our real world. In winter, night is longer than the day, in summer, the days are longer. Essentially, offset your time period, so that nights are shorter overall (and night longer for winter zones). Still there, but shorter, also offsetting the schedule so it’s based off an odd number schedule would help give variety to those who play at the same times every day. Essentially, I also like them and think they are an important factor and should be shown a little love. Word :) I am all for more variables like that, same for interesting weather effects! Sadly stuff like that isn’t much of a priority in most MMOs – that’s why LOTRO is so awesome. Does WoW still use a real-time 24 hour cycle? If not, when did it stop? I think it must have been about five years ago when I played and I swear I have no memory of there being any day/night cycle at all and I certainly played long enough sessions often to have seen the light change. WoW still has a day/night cycle that is tied to realm time. However, the difference between day and night can be pretty subtle. I play on an East Coast realm, but live on the west coast, so am generally playing at night in Azeroth most of the time, but you couldn’t tell from my screen shots. Nearly every instance group screen shot is from past midnight realm time. Sometimes the only way to tell in places like Badlands is to see if the moon is up. I think I like a sped up day/night cycle, but years of MUDs and EverQuest has no doubt influenced me in that regard. After all, much of what we do in our virtual worlds also feels sped up, travel most of all these days, so why shouldn’t the sun and moon race to catch up? Sign of the times? Sign of which times? When I mention MUD influence on the day/night cycle, that goes back to 1993 for me. And in TorilMUD, time was tracked as one real world minute to one game time hour, so a full day/night cycle was 24 minutes long. From that perspective, the clock has been getting slower for me. EverQuest was slower, EverQuest II slower still (if I recall right), and finally WoW was real time. I’m up for a little speed boost at this point. For me, that would be retro. I understand ESO is making use of the day/night cycle, with the abilities of vampires tied to it for example. I love it when there’s different events and occurences like that, feels like the proper way of making use of the feature. zombie games are trending a lot at the moment and there’s many with a really scary night full of more powerful opponents. even the mobs in Minecraft will haunt you when the sun goes down hehe….that was always fun. I prefer a strong day/night (where you can actually tell it is day or night) without too much realism. I don’t need it to be pitch black, for one, and I am cool if the cycles are fairly frequent. That said, I wish more games would incorporate different features depending on whether it is day or night. I loved how night in EverQuest meant the undead were out. Some zones were infinitely scarier at night. All in all, it just added a ton of immersion, gave the world more life, and added an extra bit of challenge! I guess my idea of a strong difference includes pitch black. :) or at least something close to it. I agree though that in such a case especially, the night shouldn’t take literally 8 hours. that would be a little much. and different features yes, please. One thing I’ve found interesting is that some games (like LOTRO and AoC) will accelerate the day/night cycle while others (WoW) will keep the same 24 hour cycle as we have on Earth. The former allows you to experience a game world at all “hours” of the day, while the other is more realistic. If there’s one thing that I don’t like about SWTOR, it’s the lack of a day/night cycle. Still, that’s a pretty minor gripe, particularly given that SWTOR often takes place in city-planets or in areas that don’t have access to the sky as we know it.